Mrs. Shaveta Jain is a Founder/Director of imaging and empowerment firm BeTheYou. 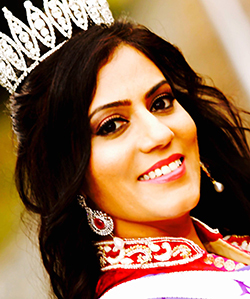 She is also the National Director for Mrs. India USA Universe at Mrs. Universe Ltd. She is an International beauty pageant winner, crowned as Mrs. India International in 2012 and later appointed as its Global Brand Ambassador. She is spokesperson for various National and International NPOs. As a Founder / Director of “BeTheYou”, she has worked with over 70 young girls and women alike by exposing them to opportunities to walk the Runway with elegance, style and glamor, in turn boosting their confidence and self-esteem with these enriching experiences. The firm has successfully conceived and produced over a dozen Runway Fashion Shows and Photoshoots in conjunction with local businesses, entrepreneurs, media companies for various events, including the First Ever Indian Bridal Segment for GA Peach Fashion Week and Goodbye Designers Convention. She believes it is only meaningful to be powerful if you can use your power to empower others! Her passionate personality and versatile nature has brought her face to face to various interesting opportunities throughout her reign and thereafter. From anchoring high profile Bollywood shows including of Kapil Sharma, Udit Narayan, Alka Yagnik and Hariharan, to sharing stage with Bollywood celebs including Pooja Batra, Preeti Jhinghiani, Reema Khan, Jhinal Pandya etc. to conducting Pledge drives with notable political figures including Senator Mr. Jason Carter. Besides she has judged various beauty pageants and have received numerous humble invites for such from all over US, Canada and India. She is a published writer on pageantry and provide formal training to delegates for National and International Pageants. Besides onstage appearances, she has appeared in a TV serial for Hum TV and have conducted interviews of high profile JAIN dignitaries from around the world for Mangalam TV. Upon several occasions, her profile has been published in various National and International media such as African American magazine named Tropics, India’s leading newspaper Times of India and The Hindu, Atlanta’s main stream media – Atlanta Journal Constitution and several other local desi magazines, including the Cover page. For her contributions, she has been awarded various awards such as Beautiful Personality of the year, Appreciation Award by NAPA and have been recognized as “Desi Making Waves” and as in “Indians in Atlanta”. She has also made celeb appearances at several Bridal and Runway Shows, Store Inaugurations, Fundraisers and Social Events.She expresses sincere gratitude to the media for continuously recognizing her work and efforts and helping her reach out to the community. By Profession, she is an IIT Delhi Alumni holding master’s degrees in Mathematics and master’s degree in Computer Science from KSU,GA. She also attended the nationally recognized NBHM Research Program at IIT Powai. She is employed for fortune 10 company and works as an IT professional for over a decade. She is married to her best friend, an IITD alumni and an IT Professional himself and is a mother of two young aspiring girls.